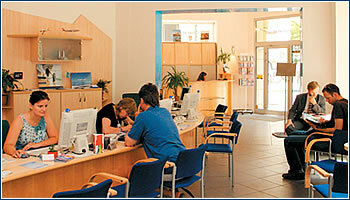 Student Agency has been active on the Czech and Slovak markets since 1993. It offers au pair positions, studies abroad, international transport, and air tickets. Currently, the firm is riding a wild boom. PROBABLY EVERYONE in Prague has had some sort of contact with it, either actively as a client, or passively through its ubiquitous advertising. Student Agency is the living story of a successful self-made Moravian who dropped out of business school. It’s hard to believe that just one person started this company, a failed-student-turned-entrepreneur who now employs 220 people and enjoys annual sales of about CZK 700 million. Radim Jančura received a university degree, not in management but in electrical engineering. His first stab at being a merchant – selling a foreign car – failed. Before the sale could be closed, the car broke down and all he wound up with was a 50,000 crown debt, which forced him to “go west” to make some money. With 47 pounds in his pocket he arrived in England, where he made his living as a laborer. He repaid the debt, and in 1993 spent CZK 4,000 on a mediation business license. In England he met many Czech au pairs and heard what they had done to get there, and it occurred to him that setting up work for them would be good business. He wasn’t discouraged by the prior existence of mediation agencies in the Czech Republic, trusting his intuition instead. He rented a small, 10.5 m2 office in the center of Brno with communist-era furniture and one telephone line. He distributed leaflets and waited. Nothing happened. The turning point came when he decided to invest in advertising. “I took seven thousand crowns that I’d been able to save and literally pasted it up as leaflets in Brno trams and in public areas. From then on, there was always someone in my office,” he says, fondly recalling the firm’s comical beginnings, which he appropriately named Student Agency. During the ten years of his company’s existence, tens of thousands of au pairs from the Czech Republic and Slovakia have gone abroad to work, and Student Agency has become one of the world’s largest specialists in this type of activity, in terms of clients served (according to IAPA, the International Au Pair Agency). However, this activity currently accounts for only 1% of the firm’s annual turnover. Jančura explains that while taking care of children is still a fashionable trend for young people wanting to earn extra cash while learning a foreign language, going abroad for foreign language training and other studies offers greater potential and better financial returns. “People are aware that if they know a foreign language they have a much better chance on the job market. And because one must constantly practice a foreign language, people keep coming back,” he says, adding that with Czech accession to the EU, accomplished linguists will be in greater demand. The dauntless Jančura, who until 1996 was the sole employee, went ahead and invested in Prague, Ostrava, Bratislava, Hradec Králové, České Budějovice, Plzen, and, most recently, Zlín and Prague’s Ruzyně airport branches. Employee hiring and training required much investment, with advertising swallowing up the rest of his funds. Until 2000 the company regularly closed out its years in the red, and with a turnover of CZK 43 million in 1999 it posted a loss of CZK 342, 000. “I knew it would work out. You can tolerate running in the red for ten years, but you have to believe you can turn it around, and do something about it,” he says with conviction. The breakthrough came at the end of the last millennium. In 2000 Student Agency began an association with Czech Television, with the owner personally handing out foreign trips to the winners of the “Home Videos” show, which was then CT1’s most popular program. The public linked the brand with its owner’s trustworthy face and the entertaining emcee. The television promotion was reflected in an enormous increase in the number of clients – from 8,000 in 2000 to 19, 000 in 2001 – which required hiring over twice as many employees, 120 instead of the former 51. Since this marketing maneuver the company has been in the black. What’s in a name?Why Student Agency, when the firm also serves adults? “I didn’t really think the name through,” company owner Radim Jančura acknowledges. He came up with the name during his studies, and he wanted to directly address the students who were his main clients when he was getting started. As the services the company provides became more varied, the name began to pose a problem, and last year he even considered changing it. But building the brand had cost a lot of money, and after the company commissioned Respond & Co. to conduct brand awareness research, which reported 74% awareness, he dropped the plan. For those whom “student agency” doesn’t quite suit, the solution is to contact Jančura’s Orbix, which was established to counter the concerns of non-students in 2002, by focusing on corporate clients. Hard at workSTUDENT AGENCY employees, 90% of whom are women, mostly between 20 and 28, are friendly, accomodating, and productive. Their salaries are above-average, but they must do extremely high-quality work and behave like professionals under all circumstances, especially during the busy season, when they work up to ten hours a day in stressful situations. The personnel department organizes not only frequent training courses, but also so-called “mystery shopping”, when non-employees are hired to pretend they’re interested in services, and individual staff performances are rated. This tool for recognizing reactions in crisis situations helps the managers understand their employees’ strengths and weaknesses. The positive spirit and the élan is palpable at the company, and according to marketing director René Libiš, it’s the result of the example set by the owner Jančura. “[He] is charismatic, was born for business, and lives for the firm. He attracts people who admire him for what he has achieved, who try to keep pace with him,” beams Libiš.